We are currently looking for video of Benny's last public performance of "Into The Night" from Turning Stone 2017. If you have video that you are willing to share, please e-mail it to mardonesbenny@gmail.com. Thank you. 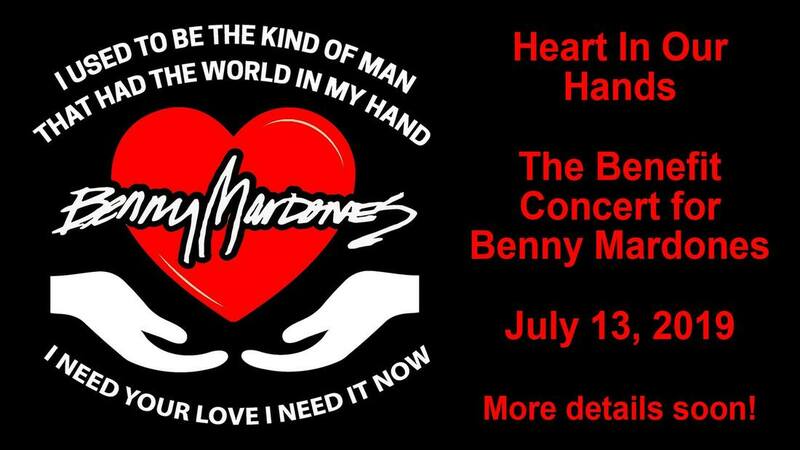 Benny Mardones and his amazing wife, Jane, are in great need of our help. Benny was diagnosed with Parkinson's Disease in 2002 and as the disease progressed, the tremors made the tasks of everyday life difficult. In July Benny underwent DBS (Deep Brain Stimulation) surgery to minimize the tremors. Unfortunately complications from these extensive surgeries made his recovery difficult with confusion and the loss of simple skills. While the tremors have minimized, his balance, stability and pain have created numerous other issues. Shortly after the surgery, Benny experienced multiple falls including one that dislocated his hip and shattered his pelvic bone. Continued dislocations and several surgeries later, Benny remains bedridden fighting infections and awaits yet another surgery for a complete hip replacement. Rehab facilities lack the proper and timely attention that Benny deserves and may remain vulnerable to further injuries. It is suggested that a nurse or PSW be hired to insure Benny's safety and facilitate his recovery. Once home personal care will need to be continued with health care nurses and physical therapists. Such care at over $300 daily is cost prohibitive and much will not be covered by any insurance. Although Jane is Benny's angel and has worked tirelessly on his behalf, she is not strong enough to care for him alone as Benny is unable to walk or support his body weight. In addition towheelchairs and other medical devices, Benny's home will need to be adapted to accommodate his lengthy recovery and return some quality to his life. We all love Benny and he means the world to us. He is a veteran of the US Navy and has given his love and time to innumerable charities including the "Make A Wish" foundation, Parkinson's fundraisers, inspiration for the disabled in Washington DC with the Secretary of Health and many many other local and personal needs of others. He played a pivotal role in raising over $30,000 for the West Genesee Athletic Club by hosting 2 Casino Nights. Benny has become a hero to many. Let's show this great talent our love for all he has contributed. We are grateful for any consideration you may provide and please share this link with your friends and contacts including Facebook and Twitter. ​Please click on the link below. Also available at iTunes, Spotify, and Amazon! 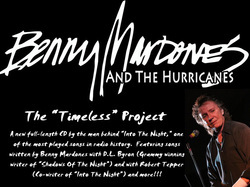 "Timeless" by the amazing Benny Mardones & The Hurricanes is here! "Timeless" is the very first CD recorded with Benny's Syracuse band, the beloved Hurricanes: John Mangicaro, Kim Fetters, Pete Levante, Andy Rudy, Todd Troubetaris & Kevin Farrell. - songs - old & new - written by Benny Mardones & Robert Tepper, his songwriting partner of "Into The Night" fame. Among others written by the duo, "Looking For The Love" is a song everyone can relate to. The idea for this CD was born when old recordings that were never released were discovered in a storage locker & is a labor of love created for Benny's dedicated fans. It would not have been possible without the support of the many people who supported the Kickstarter Program, many of whom are featured singing background vocals on the heart wrenching song "To My Dad". "Timeless" proves once again that Benny's voice is his secret weapon and it will drop you to your knees. From beginning to end, this compilation will be the crowning star in your Benny Mardones collection. 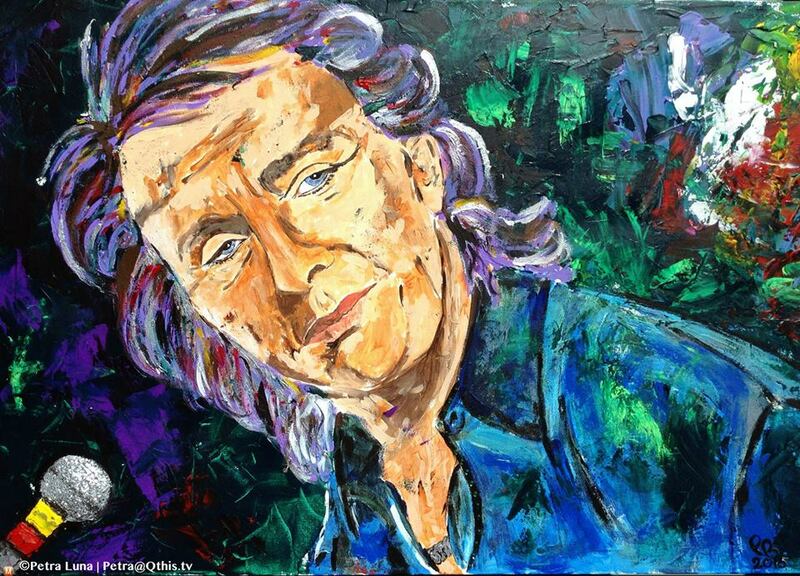 "Where Angels Fly" - Benny Mardones! CHECK OUT MY BRAND NEW SONG: "Where Angels Fly"
The "Timeless" Project is Funded! Thank you everyone so much for all your love and support. I am completely overwhelmed and humbled. The Hurricanes and I are already hard at work rehearsing and preparing to record what we believe will be an absolutely Timeless release. Thank you. And stay tuned for some musical magic. New Full-Length Benny Mardones & The Hurricanes CD In The Works - "Timeless"
Hello Friends, Family and new Friends and Family - and thanks for reading about my new project. I couldn't be more excited about this new full-length CD. It’s something I have wanted to do for years. I am tentatively calling the CD “Timeless.” I’ll explain that later. Benny Mardones exploded onto the music scene in 1980 and was quickly nicknamed "The Voice," a title earned because of his incredible range, as well as his soulful and passionate performance of "Into The Night." The song became a radio classic across the country, topped the charts twice (1980 and 1989), and became one of the most frequently played tunes in radio history. It is estimated that the song has been played more than 6,00,000 times in the US alone. And it is still played all over the world to this day. You can read my full bio on my website… www.BennyMardones.com/bio. I have been releasing records ever since then. I even have an award winning documentary about me that will be released (FINALLY!) later this year. So what is “Timeless” and why is this so special to me? Before “Into The Night,” I was in a band with an incredibly talented man named DL Byron. Our band was really popular, but we never got a deal. After a few years we went our separate ways but have remained close ever since. D.L. went on to write the song “Shadows Of The Night” for Pat Benatar and won a Grammy for song of the year. I had forgotten about a lot of those songs until a few years ago when I was cleaning out my storage room in Woodstock and found a treasure trove of old reel-to-reel tapes including the demos D.L. and I recorded. I had them transferred by my friend Alan at West West Side Mastering. They actually had to bake the tapes to get them to play. When I heard those old songs I remembered how much I loved them, and how much I wanted the world to hear them. That is how “Timeless” was born. My band, The Hurricanes, and I are going in to record some of those amazing songs that DL and I wrote all those years ago. But those are only some of the songs we will be recording. I have also been writing new material with Robert Tepper, the co-writer of “Into The Night.” The old magic is back and we will record some of the new songs that Bobby and I have been working on. I am also going to re-record some of the songs I released in the 80s that my fans love but sound really dated. That’s part of the overall goal of “Timeless”. These recordings will sound different than my other releases. It’s going to be all classic sounds, Hammond B-3 organ, big drums and loud guitars. I am incredibly excited to finally be recording a CD with the Hurricanes in my adopted hometown of Syracuse. This CD is so personal to me that I know it will be amazing. Why am I using Kickstarter? I had offers from record labels that would have funded and released this new record. But I wanted to make sure this was the record I wanted to record. It’s the first time I am in charge of my record, and I know that when you finally hear it, you will love it. If you become one of the backers of this project, I plan to take you along on the journey. I will update you with pictures, audio and video from our rehearsals and from the studio. It will give you a glimpse of all the work and fun we put into making an album. The money we raise will be used to record the album and manufacture all the goodies you see listed on the Kickstarter site. If by chance we raise more money, we will use that to promote this record to radio and press. The Hurricanes and I are so excited by this project, and we can’t wait for you to hear it. Thank you so much for your support all these years.